While I think that Metro Manila is a vibrant and exciting destination, never did I expect that the cities here would grow as rapidly as they are doing now. Hotels integrated within gigantic entertainment centers are nothing new—indeed, the hospitality industry is at its peak. As city dwellers and travelers become more eager to get their slice of this emerging travel, dining, and staycation lifestyle, the players must offer something unique, valuable, and outstanding in order to get noticed… and to survive. 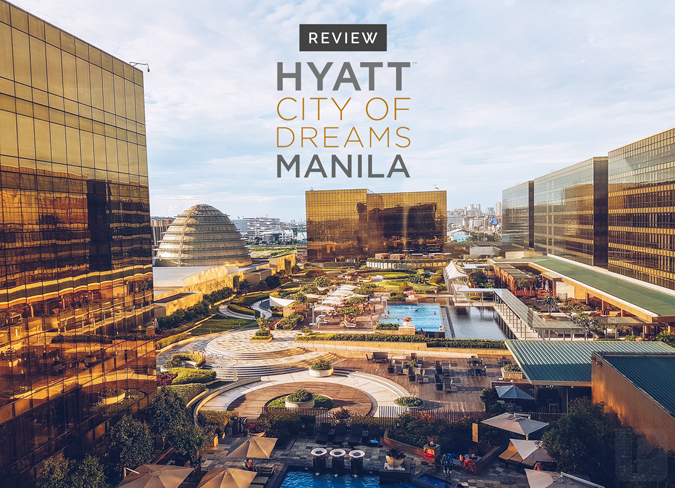 One of the major contenders in the hospitality game is Hyatt Hotel in Paranaque, situated in the entertainment behemoth that is City of Dreams Manila. Nestled within the golden monoliths of the 6.2-hectare complex, Hyatt is a modern oasis strategically built near business and leisure centers. It is 5 minutes away from the airport via the new airport road, making it perfect for business travelers; in addition, the hotel is close to some of the biggest convention centers in the metro (SMX, World Trade, and the Philippine International Convention Center). 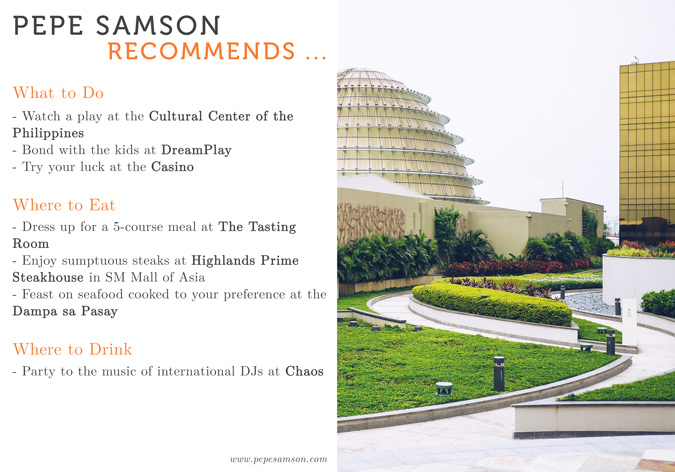 There is no shortage of options when it comes to leisure as well—SM Mall of Asia is a short drive away, and within the urban resort itself lies a host of gaming, dining, shopping, and wellness options. A few weeks back, I had the chance to stay at the majestic Hyatt Hotel and explore what is inside its grandiose walls. Let me tour you around one of my favorite hotels as of writing, by reading the detailed review that follows. It’s true that Hyatt is an ideal choice for travelers looking for a hotel near the airport and accessible to major business and entertainment hubs. However, I must also emphasize that the 365-room, 2-tower hotel is just as perfect for staying in and relaxing with fine amenities and lush dining choices. Boasting of expansive and luxurious guestrooms, noteworthy restaurants, and abundant leisure spaces, Hyatt is not only a top choice to be your nest while you’re out doing business, but it is also a destination in itself. We stayed in a Club Twin Room (51 sqm., check rates here), which features two twin beds, a sitting area, a workstation, a mini-bar, an en suite bathroom, and access to the hotel’s Club Lounge. The room boasts of warm shades of mustard yellow, paprika red, and chocolate brown—giving the space a feel of total elegance. High-backed upholstered chairs, elaborate fabrics, and plush carpeting complete the picture, forming a sophisticated and sensual ambience. The mattresses are ultra-soft and a bit bouncy, the kind that quickly ease you off to sleep. Coupled with 300-thread count sheets and feather pillows, the bed is, without a doubt, my favorite part of our room, whether for enjoying shows and movies from the 42-inch LED HDTV, for indulging with a morning cup, or for simply admiring the breathtaking view from our room’s floor-to-ceiling windows. Close to becoming my favorite aspect of the room was the stately marble bathroom fitted with an over-sized spa tub, a walk-in shower, a toilet with bidet, a vanity area, and enough space to do salsa. Seriously. I love the subdued gray colors paired with black, white, and gold—a testament to understated splendor. It comes with fresh towels, robes, and quality Portico Spa toiletries. Speaking of space, the room itself has enough for doing a round of samba (Latin dancers can better visualize what I mean). There’s a settee by the foot of each bed, and more seating area by the TV. This is one of the best rooms I’ve stayed in this year! Getting access to the Club Lounge doesn’t only mean getting to enjoy complimentary pre-dinner cocktails (yay! ); it only entails a smorgasbord of privileges like breakfast, all-day snacks, your choice of newspaper, and personalized, seated check-in and check-out. I highly recommend upgrading to a room with Club access—why? I’ll tell you more about the Club Lounge later on. Guests head to The Café, Hyatt’s all-day dining outlet, for a taste of international cuisine served for breakfast, lunch, and dinner. I’ve tried a themed buffet at The Café a few months back when the hotel celebrated its Indian Food Festival, and I’m happy to report that even the regular buffet delivers great choices and awesome quality. If you’re a checked-in guest, you can enjoy your complimentary breakfast here and partake of the restaurant’s mouthwatering selections: breakfast staples like eggs, bacon, and sausage, as well as Pinoy favorites like tapa, danggit, and daing na pusit; a wide assortment of breads and pastries; salad, panini, cold cuts, and cheese stations; a noodle station; a selection of viands; a coffee and fresh juices section; and of course, a dessert spread sure to delight any sweet tooth. I know that there are loads of sweets to choose from, but if you must get only one dessert, go for the insanely good Double Chocolate Cookies—a Hyatt signature. Enjoy the restaurant’s interactive stations for lunch or dinner as well, where more choices await. 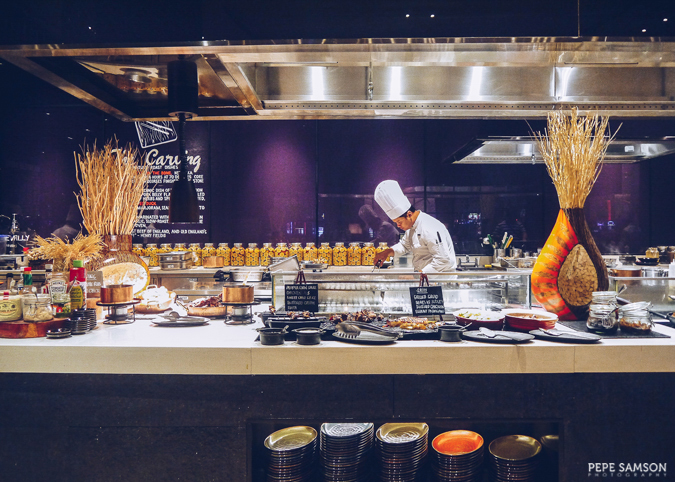 There are no rules when it comes to buffets, so make a beeline towards The Grill and Griddle first and fill your plate with grilled or baked seafood, roasts, grilled meats, and the carvery’s centerpiece: the Mayura Wagyu Beef, a.k.a. The Beast. Head over to the Italian section and try their pasta, pizza, risotto, and housemade limoncello, or indulge in the freshest sushi and sashimi, chilled seafood, charcuterie, and cheeses from The Deli. A great selection of dim sum awaits at The Asian station, alongside Chinese barbecue, stir-fried dishes, noodles, and one of the best laksa ever. The Comfort and Favorites will not disappoint with its fried selections like tempura, and dim sum, while The Pastry will make sure you get the sweet ending you deserve with its spread of chocolates, pancakes, waffles, crêpes, Pinoy delicacies, pastries, cakes, and soft-serve ice cream. Exclusive to guests checked-in at Club rooms or those availing of Club access, the intimate and cozy Club Lounge serves breakfast, all-day snacks, and pre-dinner cocktails. If you don’t like big breakfast crowds, take your complimentary breakfast at the Club Lounge. While the spread is a lot smaller, the quality of the selections is not compromised and good enough for guests to enjoy a quiet, laid-back morning meal with a view. Choose a table by the window, and enjoy freshly-made breads and pastries, cereals, salads, canapés, dim sum, and noodles, alongside a lineup of pure juices, coffee, and tea. I believe the selections change daily, but you can be sure that good old bacon-and-eggs will always be there to complete your day, perfectly enjoyed with the lounge’s delicious breads. I really liked the slightly spicy chicken noodle soup, the flaky Danishes and croissants, the yogurt, and the muesli. Oh, and the fresh juices—as someone who thinks that coffee is the top irreplaceable breakfast item, I found myself sipping on fruit juices instead of my dark brew! The all-day treats are just as good—I tried a beef sukiyaki that made me want to lick my bowl, some exquisite canapés (salami-wrapped asparagus, salmon roulade), and tasty Japanese style fried chicken. Whet your appetite for dinner with the pre-dinner cocktails available from 6:00PM to 8:00PM—sit on a cozy corner and enjoy some whisky with ginger ale or a gin tonic while listening to light music, watching sports, and savoring delicious small plates. Craving for a nightcap? Head down to the Lobby Lounge for some well-crafted cocktails, premium wines, liquors, and spirits, and light snacks. Whether alone or with friends, you will enjoy the wide assortment of drinks offered at the bar. Whisky, neat? Check. Cognac? Yup. Some good red wine? You bet. During our staycation, the bar had a special Oktoberfest cocktail lineup, all made with Furst Bismarck grain spirit. My two favorites were the Korn Sunrise (orange juice, lemon juice, grenadine) and Kornpirinha (lime, brown sugar)—both with acidic elements and letting you taste the sweetish liquor. The lounge has plenty of seating space too, so if you’re planning to meet up with clients or business partners, this is a good venue for forging relations over rounds of drinks. Make the most out of your stay by relaxing in Hyatt’s amazing swimming pool. Cool off with an afternoon dip, or do some laps as a morning workout. I love how gorgeous the geometric façade looks, each square of gold reflecting the beautiful skies. Recline in one of the poolside loungers and marvel at this view, or feel the serenity of the clear blue pool. There’s also a kiddie pool, perfect for bonding with your children, as well as a whirlpool. A few steps away, you will also find a small garden that leads to the Nobu Hotel swimming pool. Guests wanting to keep up with their fitness regimen can use the hotel’s Fitness Center, equipped with Life Fitness treadmills, bikes, steppers and weights, and open 24 hours. At Hyatt City of Dreams, you’re not only a few steps away from some of the area’s best restaurants, entertainment centers, and business hubs—you’re also free to lounge around your lavish bedroom, treat yourself to a sumptuous feast or exquisite drinks, or simply sit back and enjoy plush amenities, all within the hotel’s ostentatious walls. However you choose to spend your time, Hyatt’s take on luxury and hospitality will have you wanting to go back to City of Dreams even before you have left. The rooms are luxurious, the baths spacious, the beds comfy, the views amazing. Awesome, friendly people at The Cafe and Club Lounge; front desk staff can be improved. Great varied selections at The Cafe and Club Lounge. I love the elegance and stateliness of the hotel and its facilities. 5 minutes from the airport, near major business and commercial hubs. A great airport hotel close to business and leisure city centers, and one perfect for staycations as well. Front desk staff can still be as friendly (or friendlier) than the amazing staff at The Club Lounge check-in/check-out desk. Have you stayed at Hyatt City of Dreams Manila? How did you find it? My stay was sponsored by Hyatt City of Dreams Manila. All opinions, however, are my own.